Too funny - was thinking of buying this for some Christmas gifts...was Caleb able to play too??? Whoonu seems like absurd fun. The kids like Hullaballo and would recommend it. Liz and Tristan like the original Cranium game. We like the Original CRANIUM. This one looks fun! I love the original Cranium, but I would love to try the Hullaballo, because it looks like fun!! 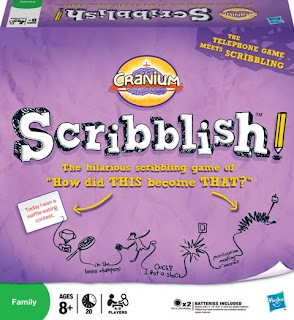 Although I have never played it; I would love to try the Original Cranium game with my family this Christmas. Thanks so much for the opportunity! I have only played the original Cranium game, and it is a lot of fun. I like the cranium party playoff. 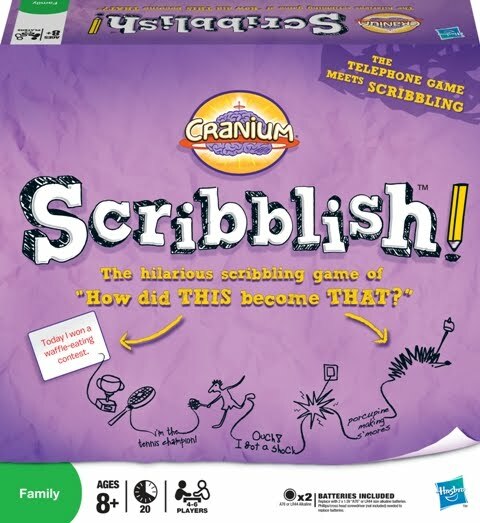 I would love to play Scribblish if my family we play board games every thursday night and this would make a great addition. We've played a lot of our games to much so we could use a new one to spice things up. Never tried Humdinger game before. That looks like my teens would enjoy it. Cranium Party Playoff is so fun!! I have only played the original cranium. I would love to buy the Whoonu game. sounds like fun for a group play! I've only played the original and that was fun. This looks fun too! Whoonu looks like a lot of fun and it seems like it could start some good conversations. I follow on Twitter under Bookloon. We do not own any cranium games yet but Cloodle sounds like fun.Thanks! we only have the origninal. We like to play Cranium Whoonu. We like to play Hullaballoo. I like the Original Cranium. Regular Cranium is my favorite to play! We love the original Cranium! Our family LOVES Cranium WOW! Such a fun, fun game. we're fans of the original cranium. We are absolutely a Who Nu family. Who Nu is a game we can play with all ages of children. We like Cranium Party Playoff, thanks! Sounds like a real fun game! We loved the original cranium. I like the original cranium game.